Even at the worst, over-stocked, local video store you might walk past this film. No typical “hook” is there to grab you. The only reason I think this was noticed by anyone was the brief appearance by Nick Frost, one-half of the Simon Pegg/Frost comic duo (Shaun of the Dead, The Fuzz, Spaced, Paul). And Frost manages to steal each scene he is in. But the rest of the cast consists of unknowns. That may be a big reason why this movie works so well–it’s all low budget and no single star factor distracts us from the fact that this random group of people got handed this unusual dilemma. 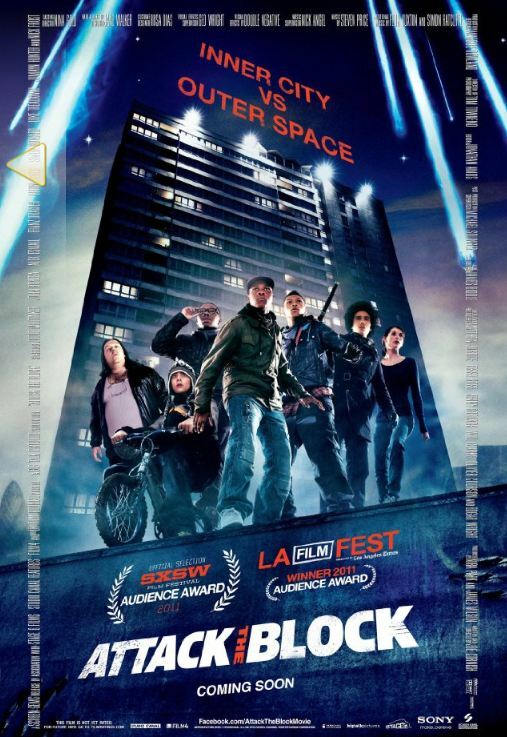 Yet Attack the Block has the single best alien in any recent alien film, big or low budget—giant dark, furry beasts built like a hybrid gorilla/buffalo, with phosphorescent blue fangs, able to leap and spring and climb buildings. We don’t ever see crystal clear views of these creatures, and that mystery and an overall lack of gore throughout the movie helps form the mystique of these creatures, and makes them just plain scary as they chase their targets down hallways and up buildings. They aren’t “aliens” from Alien or “Predators” but they don’t need to be. The setting is completely low budget—taking place on a UK city block and inside an apartment complex. How did anyone sell this film concept? On paper it doesn’t add up. So it’s an awesome treat that writer/director Joe Cornish stuck to his 1970s sci-fi horror vision and made this film a fun, exciting ride, even if it’s on the low budget side. It takes a bit to warm up to the main cast of Attack the Block. 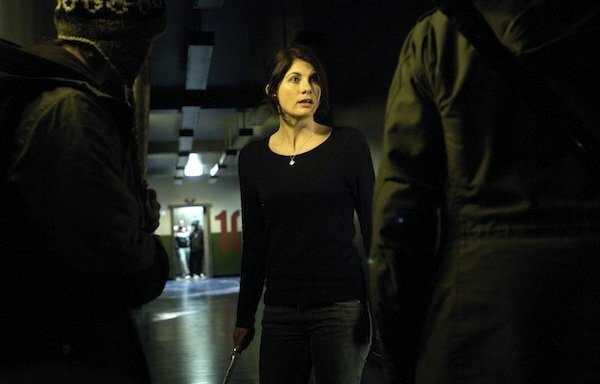 We follow a teen gang of British kids in masks as they unabashedly and violently mug a woman (nicely played by Jodie Whittaker). From then on she really is the only person in the film we are completely sympathetic toward, despite efforts of the writer to get viewers to understand the gang of kids. We almost get to the point of sympathy for the others once the victim decides she may very well be killed if she does not join up with the young, armed gang, and this film takes a swing at answering the question: “Under what situation would a victim join its attacker in a common enterprise?” Violent alien beast invasion, of course! But it’s a tough sell. The gang is led by 18-year old actor John Boyega as 15-year-old Moses, and some of his appeal may be that he is a dead ringer for a young Denzel Washington. Despite being a thug, he has his own charisma and it’s understandable why he has his own band of followers. He gets in over his head dealing with a slightly older drug kingpin who “owns the block” and takes the kid under his wing for a drug sale. Moses’s minions are a motley group. Along with a pair of much younger kids that add some comic relief and an additional wandering, stoned teenager, they must come together to fight the gang leader and worse—the onslaught of big furry aliens. The aliens aren’t just here to take the planet, as best as we can tell. It seems the first alien, killed by Moses in a rage, carries some type of pheromone that the other beasties can’t resist, and the pheromone is all over the blood that is all over Moses. Since the block is under attack, it is up to the young gang to defend the block. Don’t bother asking where all the other tenants are the night of the invasion–just go with it. A key element of this film that puts it in a small group of productions like Law and Order UK and Daniel Craig’s movie Layer Cake is the South London street slang. Surprisingly it is all very easy to comprehend, despite being its own almost incomprehensible language. For me, this was one of the best features, as the slang goes off in so many different directions that it adds a nice comic bit to the film. Subtle elements in the film touch on social class strata in this neighborhood but race itself is not an issue, as the gang has a mix in its membership, black or white, gangly or large, smart or dopey, they all must live together and get along on their block. It all amounts to a good if not great mishmash of tough kids trying to act tougher than they are, a victim trying to make it through a bad situation, aliens, a community in defense of its turf, kids learning that actions have consequences, and… did I mention nicely realized aliens?